How Far is Aditya Royal Palm? Royal Palms invires you to live a relaxed life in triplex villas built in quiet environment. Royal Palms at Shaikpet is located just 3 kms from the increasingly commercialized and saturated Jubilee hills. 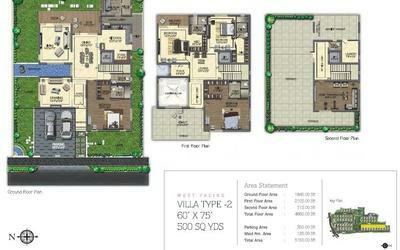 The villas evoke your passion to live a life in style. Each villa lets glorious sunshine and breeze permeate your homes unhindered. 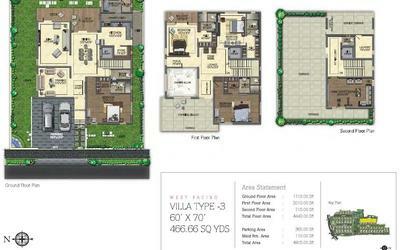 The 4-bedroom villas are designed to accommodate your needs and fantasies. Sturdily built with classic features. Each villa bring pride to its residents. The well-defined interiors are adorned with the highest quality fittings and fixtures. As indoor merge with outdoors, the ambience becomes truly magical. Another magnificent project from aditya Homes where setting standards has become a routine. 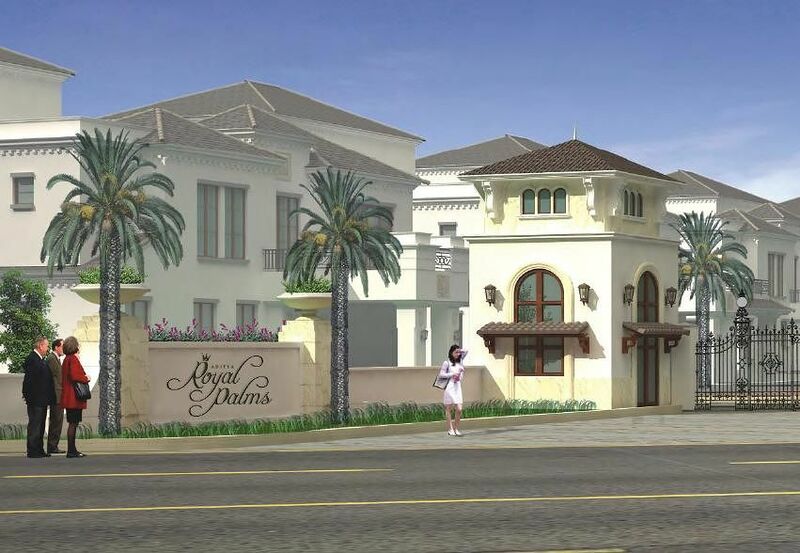 Royal Palms is a splendid gated community meant for the elite. 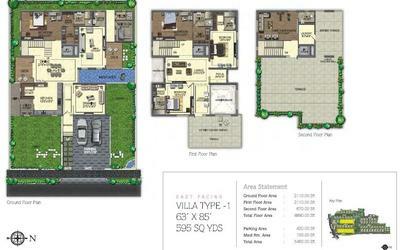 It presents grand triplex villas for ultra-luxurious living in spacious plats. Meant for 63 kingly families. Royal Palms is an island of serenity where villas are profuse with charm and elegance. Leave the banal world behind the gates and enter the domain of your dreams. R.C.C framed structure to withstand the wind & seismic load. Brick masonary with first class moulded clay bricks in cement mortar (1:6) proportion. Double coat sponge finished plastering to internal & external walls. B.T.Wood door frame & shutter with aesthetically designed with melamine polishing and designer hardware of reputed make. M.T.Wood frame & solid core flush shutter with both sides veneer, polish of reputed make and standard hardware. M.T.Wood frame & solid core flush shutter with one sides veneer, polish and other side synthetic enamel paint of reputed make and standard hardware. UPVC sliding windows with mosquito net provision. Split A/c provision for all bed rooms and halls. Combination of texture and Birla wall care putty over a coat of primer and two coats of emission paint. (Asian or equivalent make). Two coats of Altek Luppam finish over a coat of primer and two coats of plastic emulsion. (Asian or equivalent make). Wooden Flooring of reputed make. Vertified tiles of reputed make. Good quality acid resistant anti-skid ceramic tiles of reputed make. Good quality rustic series ceramic tiles of reputed make. Glazed ceramic tile dado up to 2'-0" height above Kitchen Platform. Glazed ceramic tile dado up to 3'-0" height. Granite platform with stainless steel sink and both municipal & bore water connection & provision for fixing aqua guard. Provision for exhaust fan & chimney. Water supply points in kitchen / toilets as required. Water supply is through Hydro Pneumatic system. Separate water meter for individual units. Granite counter top wash basin with hot and cold basin mixture. Hot and Cold divertor mixer with shower. All C.P fittings are chrome plated of Hans Grohe / Roca / Jaquar make or equivalent make. Concealed copper wiring in conduits for lights, fan, Plug and power plug points wherever necessary of finolex / Anchor or equivalent make. Power plug for cooking range, refrigerator, microwave ovens, mixer & grinder in kitchen. Plug points for refrigerators, TV & audio system etc., wherever necessary. 3-phase supply for each unit and individual meter board. Miniature Circuit Breakers (MCB) & ELCB for each distribution board of standard make. All electrical fittings of Crabtree / Legrand or equivalent make. Solar water heating system to be provided to individual Villas. Telephone points & TV points in Drawing, Dining & all bed rooms. Intercom facility in all units connecting to security & amenities. Internet provision in master bed room and using CAT 6 cable. Wi-Fi near Clubhouse and Park. 100% Power back up except A/c & Geysers. 8 Passengers lift with entrance of Granite/ Marble cladding.